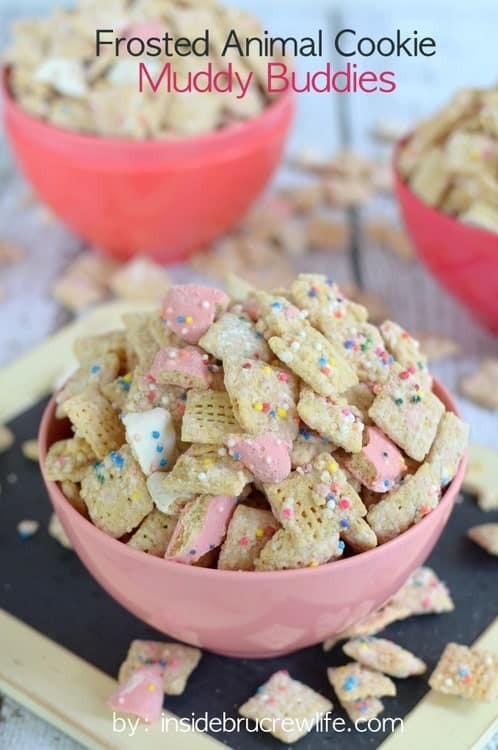 Frosted Animal Cookie Muddy Buddies: White chocolate covered Chex cereal coated in crushed animal cookie crumbs and lots of sprinkles. You might want to make a double batch of this. One for you and one for everyone else. So, I found out a piece of interesting information. If you let your driver’s license expire more than 6 months, they make you take a written test again. How do I know this? Well…let’s just say mine has been expired for a while. And by a while, I really mean more than a year. Now before you give me grief, I honestly didn’t know it was expired for about a year. I know, I know. I should keep up on these things more. But in my defense I haven’t been stopped for any driving offenses, so I’m thinking this is good track record. Now the last few months…yeah, I might have known, but I didn’t do any thing . But last week we bought a new (to us) vehicle. The guys in the auto dealer might have given me a hard time about it. 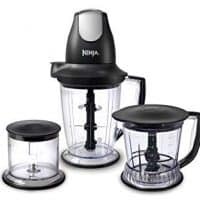 Plus, with our loan I now have to get it updated. So, I went in to get it taken care of. Yeah…I didn’t get it done that day because I’m a little nervous about taking the written drivers test. Seriously! It has been a long time since I have taken one. I’m going to need lots of chocolate covered treats to help me study through this stuff again. 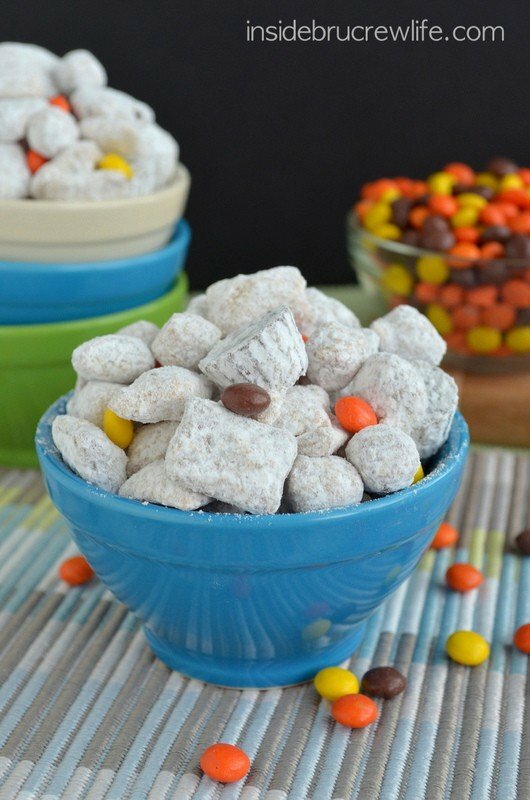 Last year I made a Chocolate Chip Cookie Muddy Buddies that I couldn’t stop eating. Cookie crumbs and melted chocolate is always a good idea. I just love these cute little paper boxes and lids. To make them I used the Box & Lids Die Cut from We R Memory Keepers/Life Style Crafts. They are so cute. Just think of all the things you could fill them with. M&M’s, mints, and lots of muddy buddies. *You can use the code BRUCREW to save 20% off your order if you want to make fun paper crafts or cards. 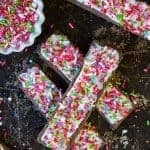 This Frosted Animal Cookie Muddy Buddies is so easy to make. I like to make a big batch of it because the three kids in my house devour it. Ok, fine. I’m usually the guilty culprit that munches on way too much of this. 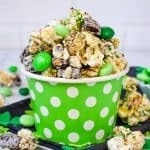 Four ingredients is all you need to have this snack mix in your house. Five counting the extra sprinkles. 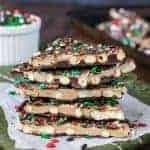 1 box of Chex cereal, 1 bag of frosted animal cookies, 1 package of vanilla CandiQuik, and powdered sugar needs to go on your shopping list this week. Crush just enough cookies to make 1 1/2 cups of crumbs. Extra sprinkles are a must. Stir them into the crumbs too. Melt the CandiQuik according to the package directions. Pour it over the cereal and stir it to coat everything. Now you can either spoon the mixture into a big ziplock bag or a container with a lid. 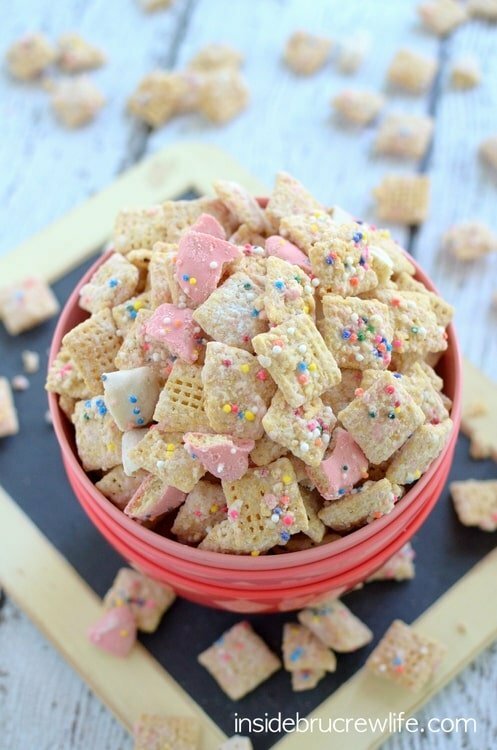 Shake the cookie crumbs and sprinkles over the cereal, then add a little bit of powdered sugar and shake again. Pour it onto a tray and let it set. 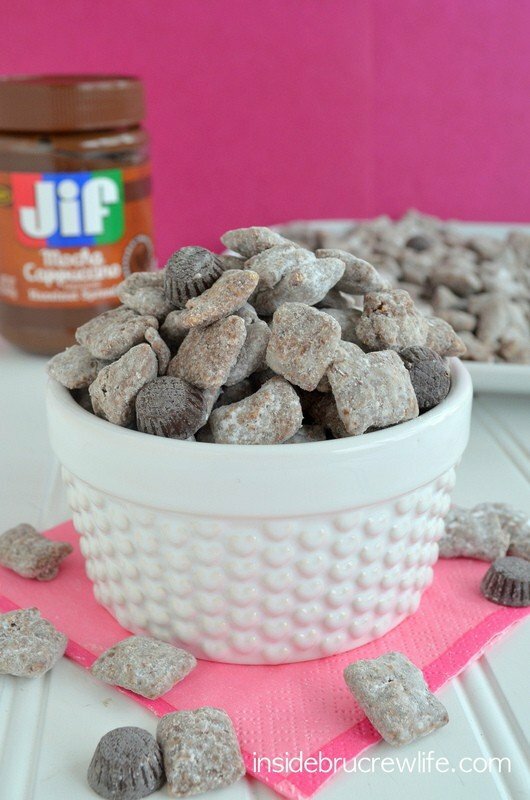 Break up the extra cookies and toss them with the muddy buddies. Then get ready to munch your way through the whole batch! 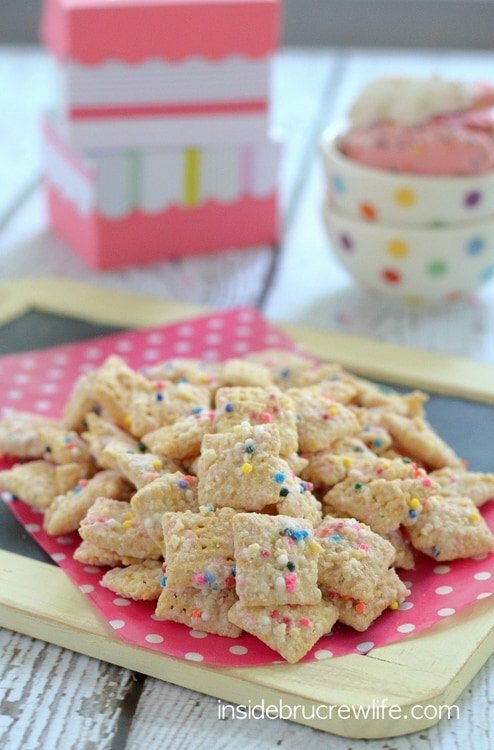 Crushed frosted animal cookies and sprinkles give this Frosted Animal Cookie Muddy Buddies a fun cookie twist. Crush enough frosted animal cookies to make 1 1/2 cups crumbs. Stir in the sprinkles and set aside. Melt the white melts according to the package directions. Pour over the cereal. Place the cereal in a very large ziplock bag or container with a lid. 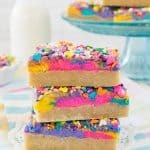 Pour the crushed cookie and sprinkles over the top. Close the bag or container and shake until everything is covered. Open and add the powdered sugar. Shake again. Pour out onto a tray to let set. Break the remaining frosted animal cookies into chunks. Stir into the muddy buddies. Store in a sealed container. *I am a studio member for We R Memory Keepers/Lifestyle Crafts. I am sent products in exchange for sharing fun projects on my blog. No other compensation is given. All opinions are 100% my own. I would inhale this! Too dangerous to even have around 🙂 Pinned! So…. have you taken the test yet?!? Did ya pass? As I was reading this, I thought you were going to say that you brought these treats into the DMV to give to the people who worked there. haha! These have got to be the best muddy buddies yet! 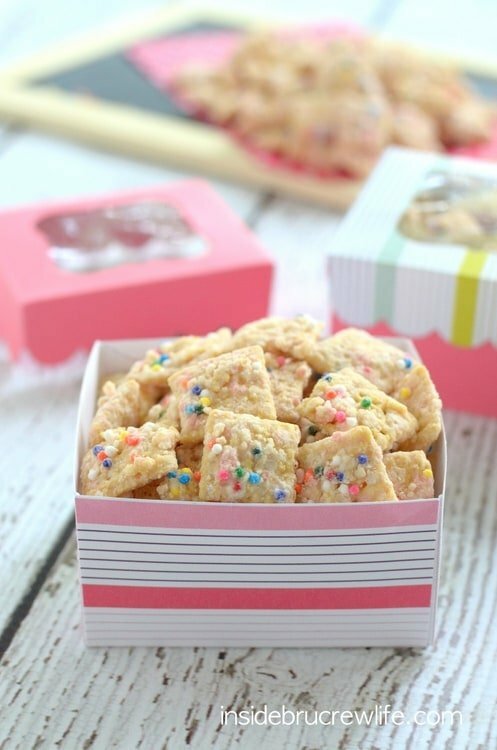 Seriously a super fun idea and who doesn’t love animal cookies?! Love your set up and photos! Pinned! Oh my goodness, I would eat the whole batch myself!! These are so fun Jocelyn! What a great idea 🙂 Pinned! And can’t wait to make them! That looks delicious! So fun and sprinkley 🙂 Pinned! Why worry about renewing your license when you’re so crafty with boxes? 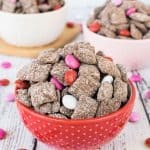 Love this version of muddy buddies! So much fun! I’m in love. Thanks for making me feel less crazy for being obsessed with those frosted sprinkly animal cookies! These are so cute! And I bet they’re delicious! I would be TERRIFIED to take the written test again. 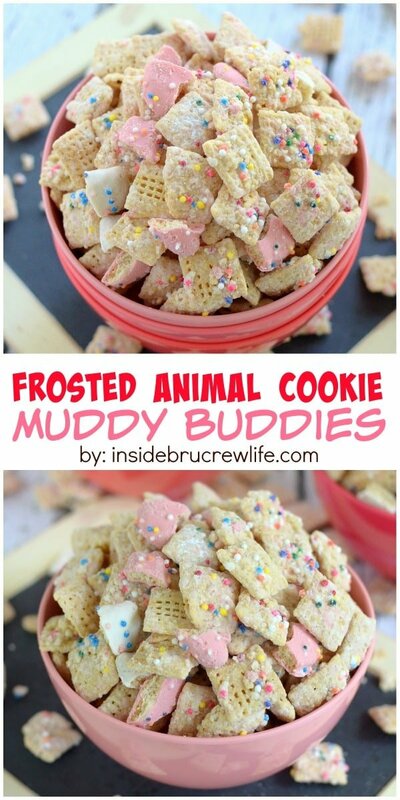 Such a fun idea for muddy buddies! 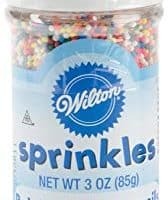 Love all the sprinkles! That’s crazy!! I’ll never forget when we moved to AZ and I had to re-take the test. I was so nervous! But at least there your license expires when you’re 65. I know, right??? I never want to have to worry about taking that test again! These look pretty fabulous by the way!! Love muddy buddies! How nice of that police officer! 😉 Thanks Emily! These are so freakin’ cute Jocelyn!! Naturally I love the pink color, but I could easily see myself munching on these all night long. 😀 Delicious! When I moved to California, I also had to take a drivers test to register here. I almost failed by one question LOL. Loving these muddy buddies!! Oooh I love these! 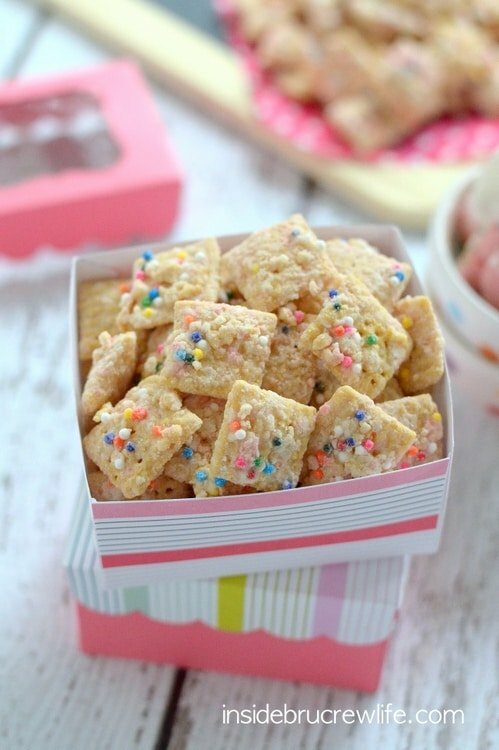 What an adorable and girly snack mix! These look adorable & addicting!!! So cute, sharing! I saw your two pictures on Instagram, and I was wondering what the story was… Congratulations on your new Prius, and YAY for being a not-quite-illegal driver again!! 😉 My mom lusted after all of the Prius cars for ages because she really wanted that carpool lane sticker. (The commutes in Northern CA can be so brutal!) All of her wishing kind of rubbed off on me, and I think I want my next car to be a Prius too! 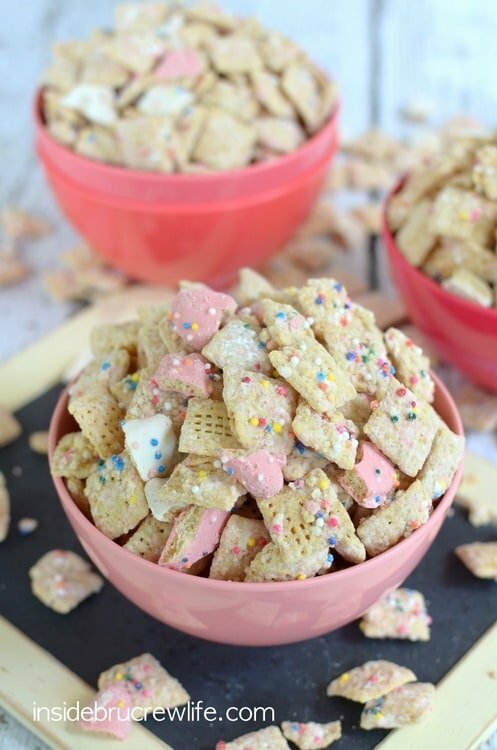 And these muddy buddies — ohmygosh I want the whole bag!! It’d totally be worth the sugar high! Officially obsessed with these, Jocelyn! I am a self-proclaimed Animal Cookie FIEND and can easily polish a bag of those bad boys. Loving this chow!! Hello! 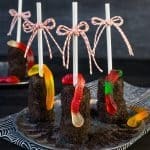 I want to make these so bad, but I am confused on what one of the the ingredients is. What is CandIQuik? Let me know. Thanks! 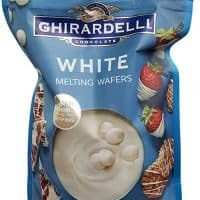 It is a brand of white melting chocolate. You can use whatever brand you can find.